The storm is expected to affect commutes on Monday, Tuesday and Wednesday. A winter weather advisory was issued Sunday for counties across West Michigan that starts on Monday night. The advisory warns of mixed precipitation with total snow accumulations ranging from three to seven inches. On Monday night, there will be snow showers working from south to north that will transition from sleet to freezing rain. The advisory goes into effect at 7 p.m. Monday. Tuesday there will be a wintery mix and snow showers will take over as temperatures fall overnight. The winter weather advisory goes until 1 a.m. on Wednesday. NWS warns of blowing snow and low visibility on Tuesday night and Wednesday morning. 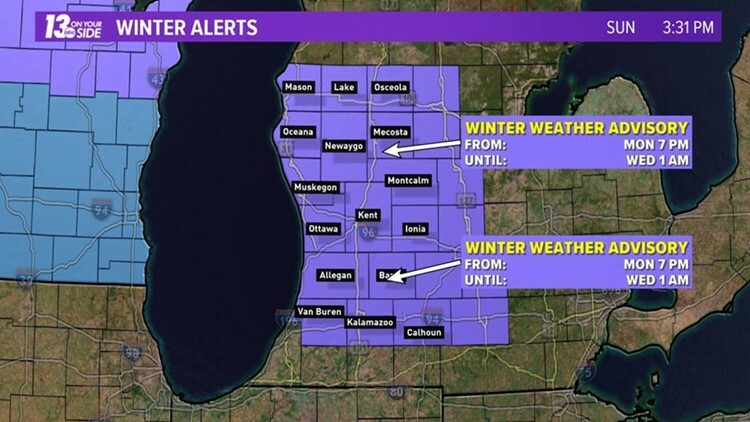 Allegan, Barry, Calhoun, Ionia, Kalamazoo, Kent , Lake, Mason, Mecosta, Montcalm, Muskegon, Newaygo, Oceana, Osceola, Ottawa, and Van Buren Counties are all impacted by the advisory. This winter storm follows weeks of severe weather that has hit Michigan. At the end of January, a snow storm was followed by a polar vortex which prompted thousands of closings statewide. Then, in the first week of February, West Michigan was hit with two ice storms and high winds that knocked out power to over 200,000 Consumers Energy customers. Consumers Energy is preparing for the possibility of this severe weather moving into Michigan and they are encouraging the public to be ready as well. Have a news tip? Email news@13onyourside.com, visit our Facebook page or Twitter.